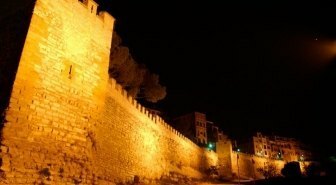 The walls are preserved in Cervera, essentially, medieval and were built the fourteenth and fifteenth centuries during the reign of Peter the Ceremonious. They were built on an existing site s. XIII. All totaled nearly circuit 3.000 metres. 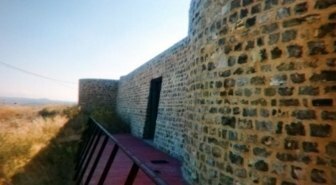 The fortification was completed with an eight meter wide moat, barbacanes, slope, battlements, shell bracelets, and round the scaffold steps that allowed the facility • installation bombards. 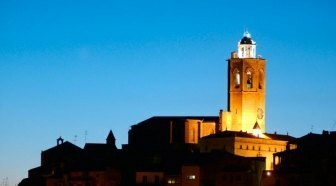 The robust bell tower of Santa Maria de Cervera, d'us 50 meters and Gothic architecture, date of the fourteenth and fifteenth centuries, rises on the Col·and Church of Santa Maria and the Town Council, offering a spectacular view of the square and the city. 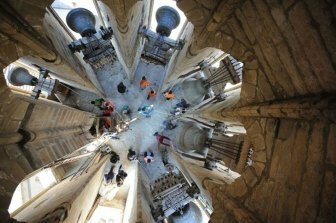 touches: Cervera bells are still played by the bell completely manual, Like hundreds of years ago. This is a surprising exception. Building started building the last years of the thirteenth century, was built during the s. XIV and was completed s. XV. Another feature to note is that the tower is fitted between the church and the Town Council and it contains six bells are still surrounded by hand. Probably the most important building in the city representative, for its importance in history. 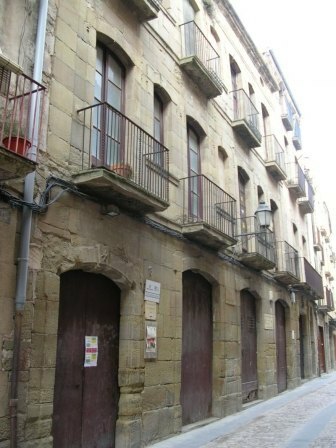 It is a closed building, Structured around three courtyards. The main façade is Baroque, built of stone blocks and a doorway framed by two columns on each side. On the door stands the figure of the Immaculate Conception, patron of the institution. On the highest point stands the royal crown, reminder of the founding monarchy. The chapel and auditorium contains a magnificent altarpiece dedicated to the Immaculate, who was the patron saint of students. 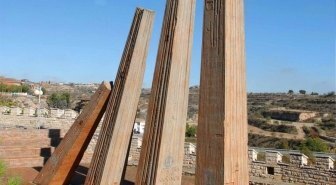 Work of JM Subirachs, represents the recovery of the Generalitat of Catalonia, with the most important milestones in our history recorded in one of the four pillars, symbols of the four stripes of the flag. Work of Cesar Martinell, disciple of Gaudi, highlights its contrast and shows the typical parabolic arcs used in modernist architecture with rectangular base of the building. Its main function was to house the machinery of the flour and provide agricultural services in order to reduce consumption and costs depend on middlemen to a minimum so that farmers removed more in benefit. 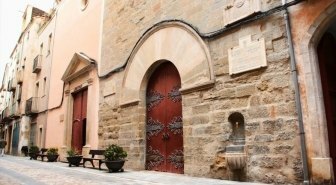 Baroque building of the seventeenth century, extended the eighteenth century, which is situated in the main square. 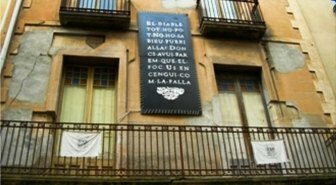 The façade of this majestic building include the brackets beneath the balconies, of which each group represents, RTL: the virtues that should have traders, the five senses and reasons related to prison. Currently made up of geriatric Mother Janer, the municipal auditorium and the chapel of Our Lady of Fire. 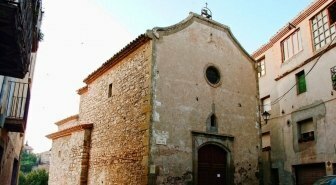 Here existed the St. Bernard eslésia, where years 1358 i 1359 Peter of Aragon presided the Catalan Parliament, considered an important episode in the creation of the Generalitat of Catalonia. L’any 1452 there were signed the marriage between Ferdinand of Aragon and Isabella of Castile, Catholic kings. During the time the university was co·College of San Carlos, run by Jesuits. Among played host to the philosopher Balmes, room which is still preserved. Located on the road to Vallfogona. 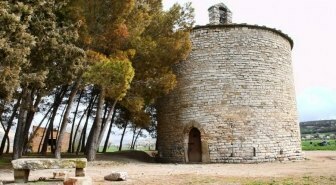 It is a small Romanesque church steeple and circular. 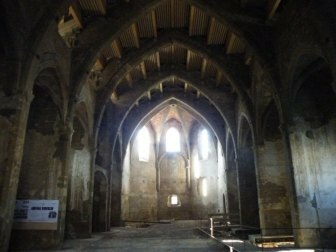 He is currently the only remaining of the monastery that had been linked to the monastery of Ripoll. Church related to the old portal in the wall of the same name. At the beginning of s. XV existed a temple on which the chapel was rebuilt in neoclassical style. Erected next to the old post Valley, venerated statue of the saint and the whole neighborhood celebrates the feast 19 d'agost, the collection of water and giving it to the people. Keep the shield on the edge of one of the balconies. Main street, No.. 61 Former residence of the lords of Pedrolo. Family novel • lista, playwright, poet and translator Manuel Pedrolo, one of the most prolific writers of contemporary Catalan literature. Is erected. XI, occupied the highest hill Montse. Royal jurisdiction, his shelter was forming the original core of the city. Currently only preserved the exterior walls. It is the most outstanding example of the houses of the XVII - XVIII. 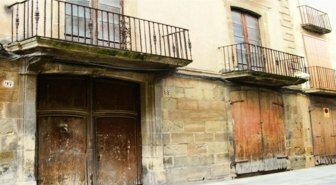 Its owner, Faust and Dalmases Massot (Cervera, 1870 – Valencia, 1938), was historian and law graduate. 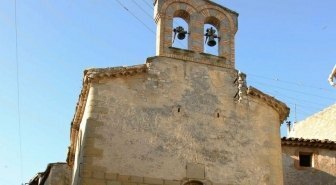 He was a copious collection·Collection of books and documents relevant to the history of Cervera region and partially deposited in the Historical Archive of Cervera. 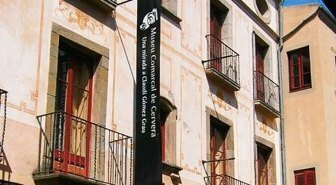 Casa Duran is part of the municipal museum Cerverí designated under the name Duran Museum and Sanpere. It is considered the ancestral home of the family Cervera Duran, while others had been held on Main Street. Aesthetically belongs to the bourgeois sensibility and taste typical of the era of restoration. Casa de l'distinguished historian, archaeologist, archivist, columnist and researcher Agustin Duran Sanpere. 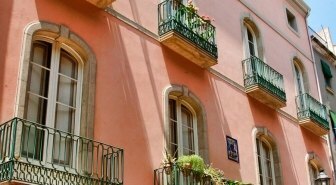 With the facade decorated with sgraffito, on the first floor retains the same furniture and stolen the century. 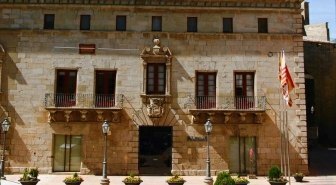 There is established the Municipal Cultural Center and, currently, is the headquarters of the Regional Museum of Cervera. 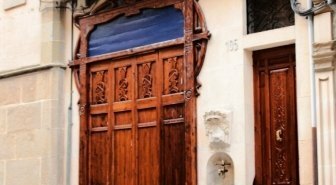 We face the only example of a house that retains the original character of the sixteenth century, a large voussoired, windows and heraldic decoration upper porch under the eaves of the roof. 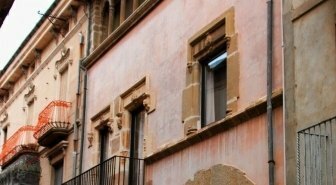 The openings are typical of the attic of the manor houses of the sixteenth century Catalan. 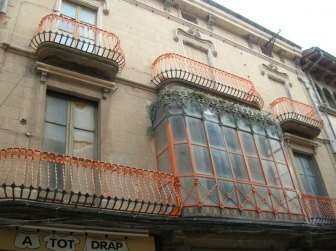 L’any 1920 the facade of the house was dismantled and rebuilt back to avoid falling. He respected the balcony, added later time. In their doors to us the modernist style of the century. La font data del s. XIX. 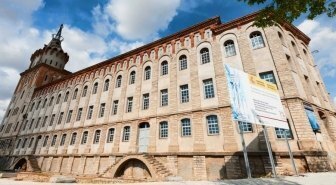 Today is the exhibition hall, the art Cerverina. Keep a remarkable modernist gallery. Gothic church of the former Dominican convent. On either side of the apse were built in the eighteenth century chapels of the Rosary and St. Thomas. Remains of the church of a single ship, which was part of an old hospital, probably dedicated to the care of leprosy. 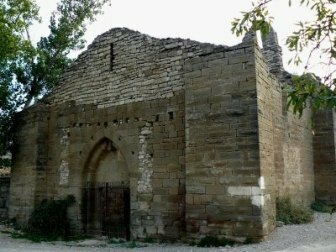 It was a house of the order of Hospitallers delmera. Stresses the Maltese cross observed on the door. 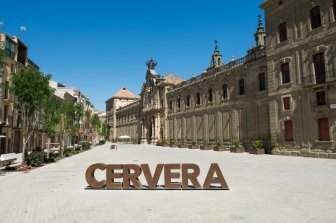 The exterior facade is part of the eighteenth century renovated by Jaime Padron. The house also hosted the founding Martinez, established to educate girls. currently used, sometimes, as showroom.